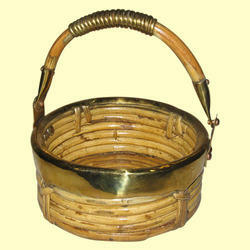 We are offering Cane Basket with Handle. Handmade home decorative hand painted bamboo fruit basket with very fine finish. Basket used for packing gift and display items. Hand crafted circular decorative basket with cane finish to store fruits or accessories or anything you want. Backed by a team of deft professionals, it has become easy for us to furnish divisive demands of the buyers and that too within shortest time possible. Owing to the complete help of our dexterous staff, we present products (Round Cane Baskets - 11 Inch) that are certified as in conformance with the set norms. We have gained expertise in delivering a wide range of Handmade "Cane Baskets" to our highly valued clients. Our baskets are really versatile and strong and can be used in many places around the home. We are the leading firm of an excellent quality array of Round Cane Basket With Net. Supplying simple yet very fancy, intricately woven bamboo baskets, cane baskets in an array of designs, multiple shapes and sizes for various uses and decorations.